Abandoned and alone, Glenn Koster was adopted at age six. Due to neglect and abuse, he had to be adopted again at age ten. Sadly, this traumatic childhood did little to prepare him for the real world and, as such, Glenn found an outlet for his pain in alcohol and violence. The Lord turned his life around though, and in 1989, he forever left his alcohol and abuse in the past. Desiring to pay it forward, but not permitted to foster or adopt because of his record, Glenn has instead determined to raise awareness for foster care and adoption. As he walks across the continental United States, the Church of God minister and Leadership Focus participant is encountering not only a wide variety of people, but also his heavenly Father in a fresh and powerful way. Indeed, the journey has been rewarding, but taxing, as well, and not only because of the close brushes he’s had with vehicle traffic. As his wife tags along in their RV, they’ve endured the frustration that accompanies recurring mechanical failure. Not only that, but Glenn recounts the cellulitis that broke out on his leg. But God did take control. It was during those same days Glenn was in recovery that the RV was in the repair shop. No additional time had to be cut from their cross-country progress. 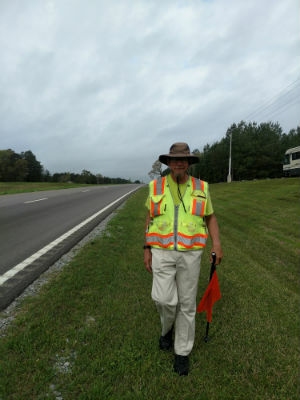 Glenn walks along a highway in the South. 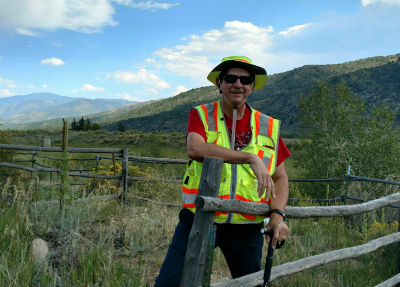 In situations where local agencies don’t exist, Glenn is happy to connect them with state resources. If necessary, he’ll connect them with national agencies. Through information and resourcing, Glenn has already proven to be a God-send on the ground. One family he met has dealt with an adopted child now thirty-four years old and struggling. Glenn’s story offered them hope. The pastor of a church where Glenn spoke had recently learned that there are no qualified foster homes in their entire county. He’d been wrestling with the best way to communicate the need to his congregation to somehow get involved. The intersection of Glenn’s walk and that church was providential. When Glenn Koster crosses the finish line this October in Seattle, his ministry definitely won’t be done. In addition to the published author continuing to write books and planning to co-host a revival, he anticipates ultimately accepting a pastorate at a local church. Follow Glenn’s journey on Facebook at www.facebook.com/KSCharitySteps. Across North America, and around the world, God is on the move in the Church of God. Reach our world. Donate today at give.jesusisthesubject.org. This entry was posted in All Church of God, Give Life and tagged Adoption, awareness, cross-country, First Church of God, foster care, Glenn Koster, Hutchinson, journey, Kansas, KS, Leadership Focus, testimony, travel, trip, walk, walking. Bookmark the permalink.